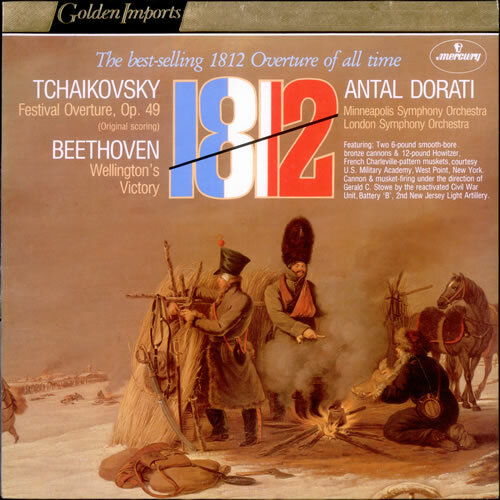 ANTAL DORATI conducts THE LONDON SYMPHONY ORCHESTRA & THE MINNEAPOLIS SYMPHONY ORCHESTRA 1812 Festival Overture, Op. 49 (Original Scoring) / Wellington's Victory (1970s Dutch issue of the 1964 5-track vinyl LP, complete with bronze cannon, muskets and bells, fully laminated picture sleeve. The sleeve shows just a little light shelfwear & the vinyl remains in excellent condition with little sign of play SRI75142).